What Is The Best Way To Use Facebook Ads For Your Business? 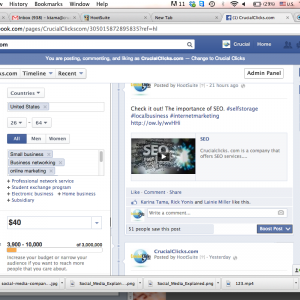 Are you thinking to implement Facebook Ads for your business? How to use it? Boost vs. Promote? It depends on the goals that you want to reach. Do you want to get likes and followers that eventually will convert into leads? Or you want to drive traffic to your website? The answer would be what's best for your business. Most of the marketers choose Boost a post because it’s the easiest way. However, my personal opinion is to Promote a post. Here I will show you in detail the steps with the pros and cons of both options. Boost or Promote, what should I do? Boost a Post works in the following way. Just by clicking Boost a Post in the lower right corner, you can Boost your post. When you click “boost your post”, it will show you a new window where you can choose to push your post to: people who like your page and their friends or people you choose through targeting. Choose original content and edit the written content. Make sure it’s short and specific. Use a call to action to get conversions. Be careful when you are working on your writing! There is a rule about text in Facebook ads called 20% rule on photos. To learn more about the rule go to Facebook’s Grid Tool. Use suggestive images so that people can click on your Ad. You don’t want to waste your money and marketing efforts. Think outside the box and create several eye catching images! Set up a budget and choose between CPC or CPM. This depends on your budget and the type of service or product you are selling. To Promote your post you have to use the Ads Manager. You need to click https://www.facebook.com/ads/create/ and select post engagement option. A window will open where you have the options to build demographics for your ads such as: Country, Age, Gender, Language, Interest, and Behaviors. Promoting your post is much better than Boosting your post because you have more of a targeting option. You just need to take your time when you are building your campaign. Therefore, still use the same parameter for engaging writing content, the 20% rule on photos, and the creation of amazing images. In promoting your post, you can choose between different bidding costs. It depends if you want to boost a post that will bring traffic to your Facebook fan page or if you want to get conversion to your website. You can use Facebook bidding models to understand better how bids work on Facebook ads campaigns. When you have done all of the above, your post is ready to be boosted or promoted. Remember to try different images and text. 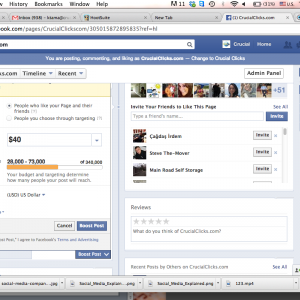 Then use the insights on Facebook options to see what ads work better. It will be a great adventure and an opportunity for you to boost your business, get visibility, engage new people, get leads, and increase your ROI through new sales. Please let me know when you have done your post. I will love to take a look. I wish you success using this amazing Social Media Tool. Any comments or questions, leave it here. I will be more than happy to answer any question and help you improve your business. "Some people need to realize that Facebook is a Social Network, not a diary".